Background: Not much is known about the mysterious Ed Monk design – now dubbed Gracie – even by her current owner, Larry Walker. 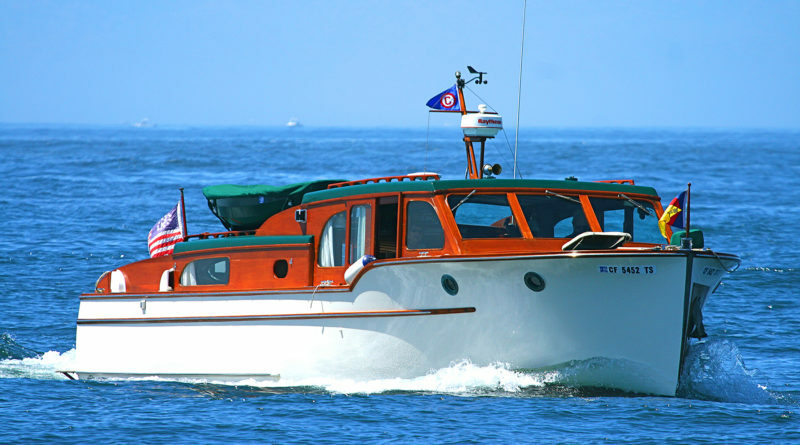 However, Walker has pieced together as much as he could about this classic wooden beauty, which was built by a Washington-based boat builder named Bud Fodor more than 60 years ago. A Boat Also Known as TuTuBaqs: Gracie wasn’t always known as Gracie. Previously, she had an owner who was passionate about birds and thus decided on the Native American word, TuTuBaqs, for a type of loon that thrives up north. “The name Gracie has no specific meaning to us – it’s just a pleasant sounding word,” Walker said. Keeping Gracie in Tip-Top Shape: “We have only made minor changes to the exterior, not counting many hours or painting and varnishing,” Walker stated. Aiming to keep Gracie in the condition she was first born into, Walker has only made three exterior additions to her: two kayaks and a dinghy. A number of decorative changes have been made to the interior, including a recently replaced ceiling material. Though Walker acknowledges the replacement was not authentic, it is more attractive and practical. One distinctive touch is the hide-a-bed located in the forward cabin. At Home in California: Gracie currently calls Cabrillo Marina in San Pedro her home. She, along with her owner, is an active member of the Classic Yachts Association.